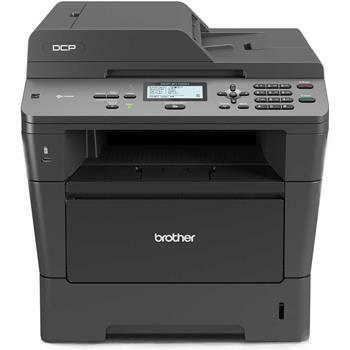 The Brother™ DCP-8110DN is a cost efficient monochrome laser multi-function copier for your desktop or busy office. It offers fast, reliable copying and printing up to 38ppm and color scanning in one space-saving design. Scan or copy multi-page documents via its 35-page capacity auto document feeder or use the document glass for bound materials. You can share the DCP-8110DN with others on your network via its built-in Ethernet interface or print from your mobile device via‡: AirPrint™, Google Cloud Print™, Brother™ iPrint&Scan, or Cortado Workplace. Plus, it offers automatic duplex (two-sided) printing to help save paper and a convenient USB Direct Interface‡ for walk-up printing and scanning. To help lower your operating costs, a high-yield replacement toner cartridge is available.